First off, I want to apologize for my absence yesterday, but funerals and family called. Second off, I want to say Happy Thanksgiving. And lastly, I want to apologize in advance for the book I am about to review, as it is highly out of character for me... but here goes. 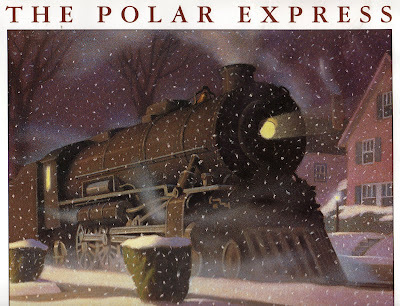 Now, some of you might wonder why I would pick The Polar Express as my first holiday offering of the season. It is hardly rare, still totally in print (odds are you can buy it everywhere from the grocery store to Walgreens), and was recently made into a massive feature film that has grossed millions worldwide and still sells huge on DVD. Well, I happened to look at the copyright page tonight and noticed the book is... are you ready for this?... 23 years old!!!! I was totally shocked. I thought it ten, 15 years old at best, sooooo, as you know, anything over 20 years is classic and fully reviewable here at VKBMKL. So here goes. Like many of you (or maybe not), I was one of those people who turned my nose up at this book. Thought it too mainstream and sentimental. Thought it over exposed and corny. And then, I actually read the book... and I would be lying to you now if I said I didn't weep like a baby at the end. On Christmas Eve, many years ago, I lay quietly in my bed. I did not rustle the sheets. I breathed slowly and silently. I was listening for a sound -- a sound a friend had told me I would never hear -- the ringing bells of Santa's sleigh. but I knew he was wrong. I won't get into it too deep for fear of giving away the punch line (for those three of you out there who actually haven't read it), but basically, the story is about believing. Needless to say, no matter how many train sets it has sold or how much dough it has put in the pockets of Tom Hanks and the people who animated its strange, big screen, IMAX version... taken all by itself, it is quite simply a great story. Perhaps even one of the last classic Christmas tales ever written. I absolutely love this story. My mom reads this story to her class of grade one children every year, and she still cries at the end. She has a little silver bell to go along with it too. I'm not a fan of the movie version, but I love the book! i know what you mean... great story though for sure! Apart from considerations of "vintage" or not this book gets high marks for its unique take on the spirit of Christmas - the whole "believe" motif emblazoned with the bell: what a stunning last page! The film, I thought, was a faithful adaptation too. 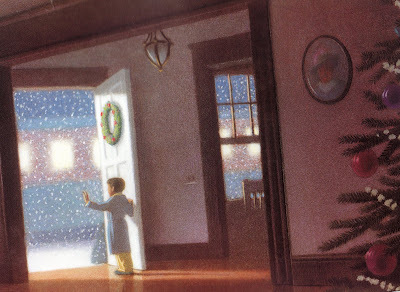 Sure, it added stuff to round out the feature length but it totally got the Van Allsburg magic. And the most believable Santa of all time. I watch it every year with my son.